Since 1990 our work has been to take an integral approach to identifying fields of research and practice which impact, or should be impacting, on education, and to combine these into a systems approach to schooling. 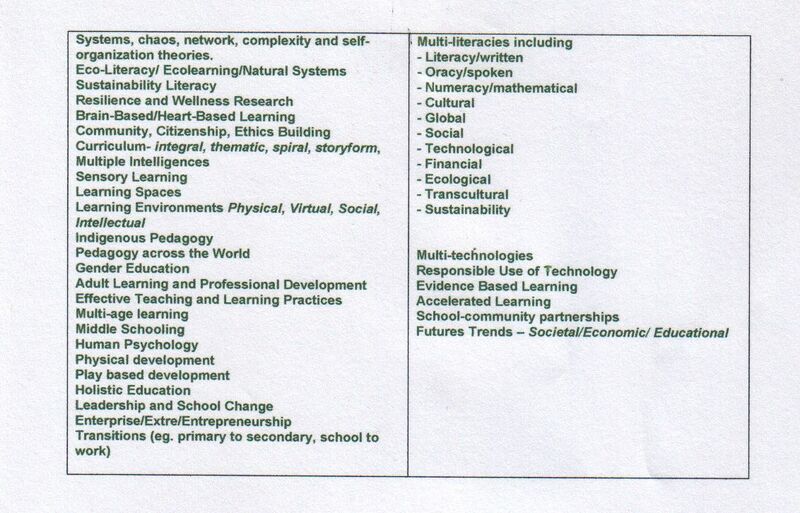 This list includes some of the fields which have been integrated into our educational frameworks which have been in use since the 1990’s, and remain current and relevant today. Education needs to prepare leaders of the future, not of the past. Politicians must make a stand in stating that one of the key purposes of education now is sustainability . UNESCO did it in 1996 when it identified the5 bases of schooling. These HAVE NOT CHANGED!